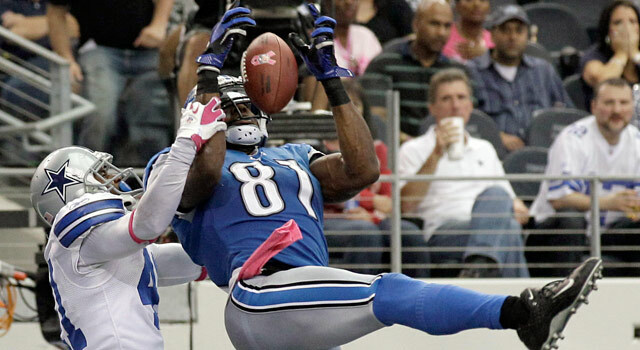 Published: May 22, 2012 at 01:54 p.m.
Calvin Johnson cemented himself as one of the NFL's elite players in 2011 with 1,681 receiving yards and 16 TDs. 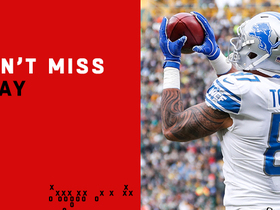 ALLEN PARK, Mich. -- The final seconds had ticked away in the Detroit Lions' 38-10 beatdown of the San Diego Chargers late last year, and those standing on the sidelines flooded the field. Detroit had finally reached the playoffs for the first time since 1999, an eternity in the parity-driven NFL for the parody-riddled franchise. Coach Jim Schwartz received not one but two Gatorade baths in celebration. When the final liquid splashed, team president Tom Lewand caught Schwartz's eye to congratulate him on a wild-card berth that served as a ray of light after a decade of darkness that featured only Matt Millen at the end of the tunnel. Yet happiness wasn't the emotion that Lewand saw from his coach. "The look on his face was almost anger," Lewand told NFL.com following the team's first session of organized team activities on Monday. "The first words out of his mouth were, 'We have to get past the point where we're dumping Gatorade on my head because we made the wild-card.' "
It was the first 10-win season since 1995. After five seasons with three or fewer wins since 2001 -- one of them 0-16 -- the NFL's perennial laughingstock suddenly wasn't so funny. So why wasn't Schwartz, in just his third season as a head coach at any level, happy? Why did Lewand echo his reaction? The answer explains why the Lions have methodically marched back into relevance. "Being satisfied about making progress is the exact wrong place to be," Lewand said. "Being desirous of making more progress to ultimately get to where we want to go is where we are as an organization. We got to get better. Being 10-6 and second in the NFC North isn't good enough. That's not good enough." 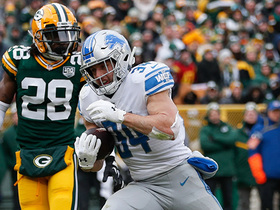 Thanks to a strong nucleus of talent -- highlighted by a trio of former top-two picks in quarterback Matthew Stafford, receiver Calvin Johnson and defensive tackle Ndamukong Suh -- the Lions ticked off plenty of firsts last season. The goal this year is to make sure none of those are worthy of headlines. The firsts must turn into the expectation. "We had to get past the point where selling out a game, or not having it blacked out, was news," Lewand said. "We had to get past the point where a Monday Night Football game was a national holiday in the city of Detroit. It's a great event, but it can't be what it was for us this year." Winning can handle all of that. To be sure, life has gotten easier. It's a better feel in the locker room, it's more fun to come to work, and long-suffering Lions employees feel like they are a part of something special. Perhaps most important is that players understand what they are working toward. "You put wins together, the team's in the postseason, guys get a taste of what it's like," Stafford said. "And it drives you that much harder to get back there." When Schwartz arrived in 2009, a surprise pick by an equally surprising tandem of Lewand and Lions GM Martin Mayhew, he focused on changing the culture. He altered schedules and the way things were done, losing many facets of a losing program. He shrugged off the initial public reaction to his moves, just as Lewand did. Lewand laughed on Monday thinking of the early days when he attended the unveiling of the team's new logo. That was when fans chanted "Curry! Curry!" in hopes of the team drafting then-celebrated Wake Forest linebacker Aaron Curry instead of Stafford. Just imagine. But Lewand was unwavering when it came to his faith in his franchise's choices, just as he was with choosing Schwartz. "We had conviction inside here with how we did our work, how our personnel department did our work, how our coaching staff did its evaluation, and made that decision that Matthew was the right guy for us," Lewand said. "Throughout the course of making these decisions, it's all designed to do what we believe is right. It's not necessarily what's popular and the easiest way to do it." Lewand and Mayhew offered no promises when they were hired, telling fans instead to judge the team's brass by its actions. When Lewand talks about the culture change, it wasn't about making people feel good about coming to work -- it was about winning. The hope was that culture would build around it, and it has. "If you deal with the substance," Lewand said, "everything else flows from that." The process hasn't been without some speed bumps in an otherwise feel-good story. The most publicized was Suh's suspension for a Thanksgiving stomping incident, capping what Suh called "an indifferent year." "This year," Suh said, "I have an opportunity to have an outstanding year, but it's a team game and I want to win." There was also a brouhaha over the postgame handshake between Schwartz and San Francisco 49ers coach Jim Harbaugh. 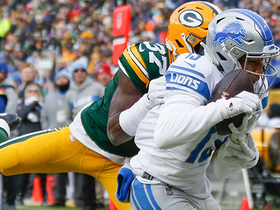 Meanwhile, three 2011 draft picks -- Nick Fairley, Mikel LeShoure and Johnny Culbreath -- have been involved in marijuana-related incidents, and receiver Titus Young reportedly was barred from OTAs after a fight with safety Louis Delmas. LeShoure put the focus on making better decisions. In another corner of the locker room, Johnson said part of the reason for the success has been filling the locker room with solid "character guys." "Guys that are willing to stick their neck out for the team," Johnson said. And perhaps that's the answer. Lewand and Mayhem filled the roster with enough high-character players so the strong foundation can allow a team to withstand some issues. 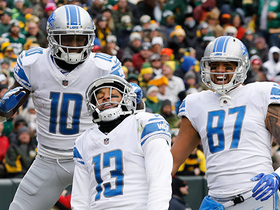 The Lions' goal now is back-to-back winning seasons for the first time since stringing three together from 1993-95, with a division title rather than a wild-card game. And if it happens, Schwartz would prefer the Gatorade bath come after a playoff win, rather than simply earning the right to play in the game. All steps along the way for this rising franchise. "Everybody has that feeling that we need to continue to win," Suh said. "(We need to) be a team that's not going to be content, that's going to be up in that echelon of teams, that's not always not surprised being in the playoffs. We still have things to work on."